Are you ready to take a Quantum Leap in your Personal Spiritual Evolution? Your light body is essentially a light pathway to your soul, Higher Self, and Source. By building and maintaining your light body, you are able to stay in alignment with Source at all times, stepping out of perceiving duality, and into fully experiencing universal love and awareness. Archangel Gabriel connects in this exciting new angelic activation which will assist you in increasing your vibrational frequency and light quotient to build your light body. Anchoring these energies of light, love and awareness into Mother Earth will help the planet and will help you to live a more connected and inspired life. Awakening your light body will increase your intuition, raise your personal vibration, and facilitate the release of physical, mental, and emotional toxins stored as body density. When your light body is fully awakened and maintained you will be able to stay in love, joy and complete awareness at all times. 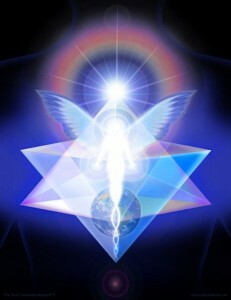 Your light body will be fully activated in 12 stages. This meditation will assist you where you are right now, in safely and effectively, increasing your light and building your light body at the pace that is right for you. This is now a part of the Lightbody Activations CD which you can purchase as a CD or as Digital Downloads here. Click here to learn more or purchase the Lightbody Activations CD.